Six years ago, the congregation heard the news they never expected to hear. Their pastor had confessed to a moral failure and would resign immediately. Without the sovereign hand of God at work in both the pastor and congregation, this could have easily been the end of the story. 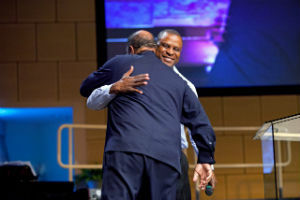 Instead, biblical reconciliation, humble hearts, and an unquenchable love for one another prompted what happened next. God’s plan would involve a marriage that held together and now thrives, the complete restoration of a minister of the gospel, and a renewal of fellowship between a pastor and the congregation he’d once served. The story of Pastor Paul Sheppard’s impact in the Church of God and beyond has only just begun. Archelle, an elder at the church who has been a part of the thriving Mountain View congregation for twenty years, cannot overstate the significance of what has taken place. “This is huge,” he explains. “It all began when one of our elders, Sanjay Poonen, went out on his own and reached out to Paul to ask him to lunch. Sanjay wasn’t an elder at the time of Paul’s resignation. All he wanted to talk about is how we can come together in Christ.” Through a series of meetings that followed, the board of elders at Abundant Life were able to clear the air. As a result, Abundant Life extended Pastor Paul an invitation to come and speak for the first time since his resignation six years ago. Archelle is overjoyed to have been a part of history-in-the making. 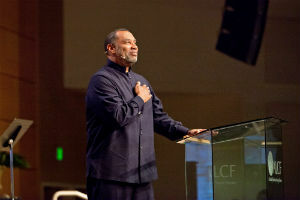 The Renewal of Fellowship service was received by both Abundant Life Christian Fellowship and Destiny Christian Fellowship (Fremont, California) with open hearts and minds. As long as churches facing similar circumstances are willing to be firmly grounded in Scripture and have a deep desire for reconciliation and seeing people healed, Archelle believes this can happen at other churches, too. This entry was posted in All Church of God, Western and tagged Abundant Life Christian Fellowship, ALCF, Archelle Funnie, California, Destiny Christian Fellowship, Fremont, healing, Mountain View, Paul Sheppard, Reconciliation, Renewal of Fellowship, restoration, revival, unity. Bookmark the permalink.